Unfortunately I did not keep a record about the origin of the following description of troops being driven to the front at Verdun. I assume it will be enjoyable in spite of this. At last the trucks arrive. We are to be spared the 15km march to the front, it would be too much to expect before an assault. Like the General's men, we will be driven, although our transport will have simple iron wheels, rubber being now scarce. We drive and drive, the clapped out old trucks coughing as their straining motors pull us across the cratered road. We are being badly shaken "Watch out for your hand grenades" calls the Vice. 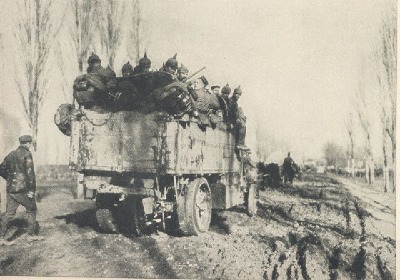 Right: Trucks on the road at Verdun. 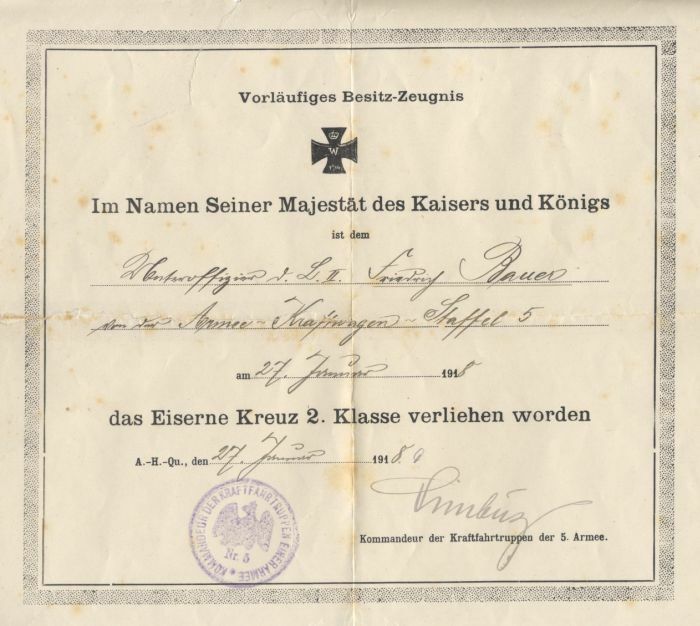 Above: The Iron Cross award document of Friedrich Bauer who drove trucks behind the 5th Army front, including the Verdun sector. Night has already fallen, and occasionally the moon peers through the forest. Here is the start of the danger zone. We are now within range of the enemy fieldguns. Something must be up already as there is thundering to the right and left of us...is it German guns firing or enemy shells exploding? The engines drown out the sound. 100 meters in front of us and 100 meters behind us are trucks filled with heavily armed men. The last trucks would be leaving the rest areas about now. The trucks form a 15km long military worm loaded with weapons and ammunition. As I said... just one splinter.... The worm wriggles through the enemy Strungsfeuer which is now increasing in intensity. We begin to hear the short, angry cracks overhead. We duck. The Vize lights a new cigarette “Watch out for the handgrenades, make sure they are secured”. We gingerly check the grenades. A new, louder "whoooosh", a red flash. Twenty meters away a salvo of fieldgun shells explodes in the swampy forest floor. Branches and leaves fly around us. The truck driver steps on the gas to get us out of the danger zone. We are speeding down an unlit road with no headlights. The only light comes from muzzle flashes of the artillery and exploding shells. Suddenly a whoosh as a shell screams in, before we can even duck the shell hits home. It thuds into the ground right in front of the truck... a Blindgaenger (dud)! 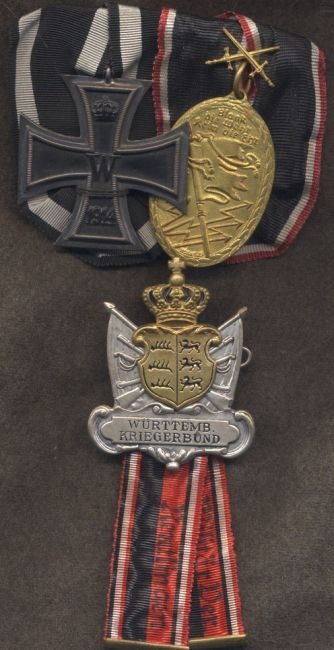 Left: The Iron Cross and post war veteran association award belonging to Bauer.